New converts and cradle Catholics alike are often perplexed by the myriad of devotions, traditions, practices, and beliefs that the Catholic Church has accumulated over the past twenty centuries. Why pray to St. Anthony to find something lost? Why keep a St. Christopher medal in your car? Or why bury a statue of St. Joseph upside down! in your yard when selling your house? 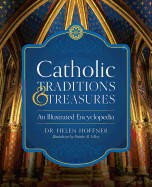 In Helen Hoffner's lovingly-illustrated, encyclopedic Catholic Traditions and Treasures, you'll find succinct and sometimes amusing answers to these and hundreds of other questions. This delightful book explains the origin and nature of most of the common traditions of the Catholic Faith, as well as the source and meaning of many of the quaint and obscure ones.